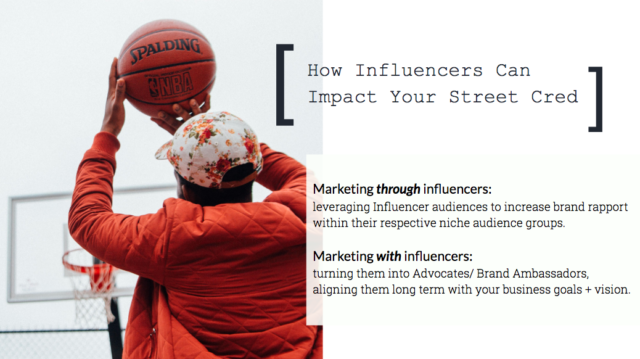 From finding the right influencers to defining a payment structure, here are the 7 key elements for implementing a successful influencer marketing strategy. In 2018, one of the hottest topics in the social space has been the continued rise of influencer marketing and its positive impact on audience rapport and positive brand association. But if you get caught up in this hype machine, you can easily neglect the insight required to ensure the investment is actually worth the effort. So, I thought it would be helpful to demystify a few of the key challenges to keep in mind when embracing this exciting opportunity. Let’s dive right in, shall we? 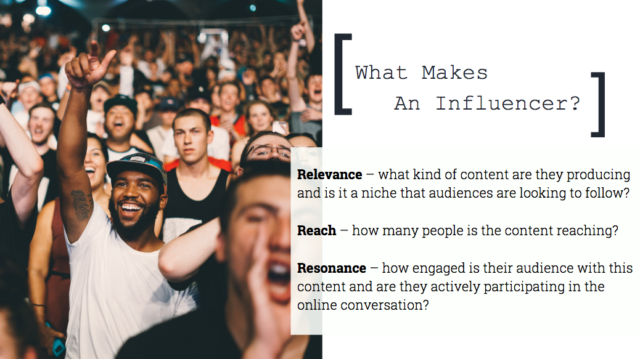 Most would define Influencer Marketing as working with an individual or publisher with the ability to influence potential buyers by promotion or recommendation. While B2C influencer marketing has been popular for decades, B2B influencer marketing has developed its own set of tactics in the last 5 years. Today, the majority of this amplification occurs across digital channels, such as YouTube, Instagram, or personal blogs. So, with all the hype around amplification options, do you know what key elements should be considered before investing your time and resources? Without a goal, you can’t score – plain and simple. With this in mind, marketing leaders often set more than one goal to consider any campaign a success. The essential ingredient to any Influencer Marketing initiative is to know your goal and how it will be measured. Once you’ve got that, you can reverse-engineer the strategy to complement the outcome you aim to achieve. Consequently, defining a specific target audience will ultimately narrow the Influencer selection process. 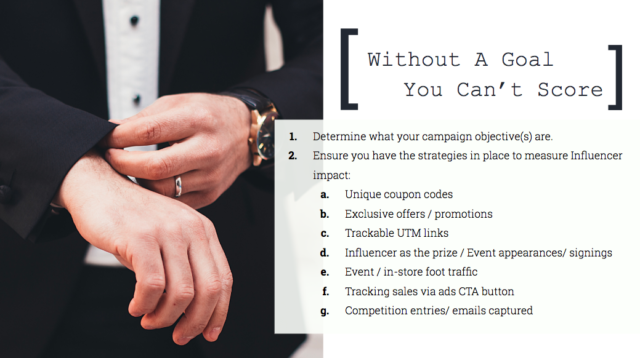 To effectively engage with ultimate force, create an offer that will be the centerpiece of your campaign with a specific influencer. It should include a direct call to action which showcases intent from your target audience group. For example, if you’re using an influencer to promote a special offer with an exclusive coupon code (which is extremely trackable), you’ll be able to view the direct reach and resonance you have gained through the audience of any individual influencer. With that in mind, if you are able to engage multiple influencers, you can split test the impact of each one and identify the top performers. Later, you will know which ones to re-engage in ongoing marketing collaborations. 4. 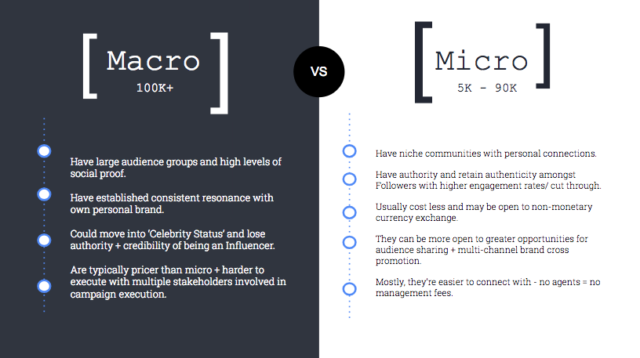 Choose between micro- and macro-influencers? What is your campaign budget? Does your product resonate with niche or larger social communities? What is the general engagement level for the Influencers you’ve shortlisted? Do they consistently engage with their respective communities and is it organic? Are they dishing out brand shoutouts every second day (and as a result, losing credibility for their recommendations) or are they selective with their collaborations? How flexible are their agreement terms and content turnaround times? 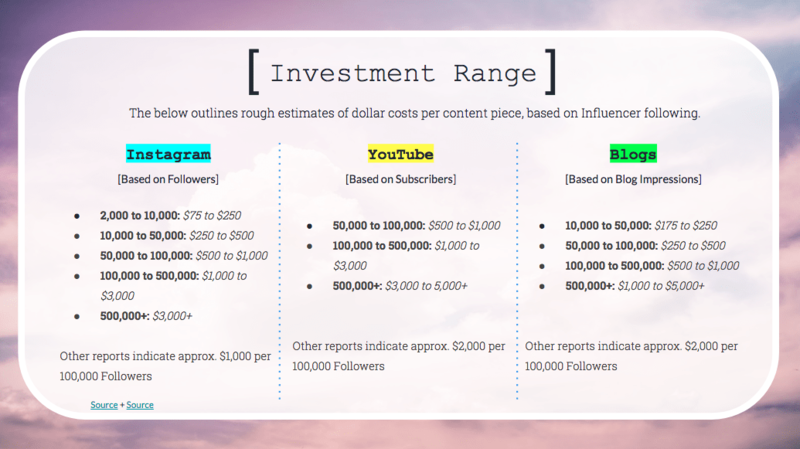 Once the above has been confirmed, you’ll be able to make the best decision for your brand campaign and the Influencer you choose to invest in. 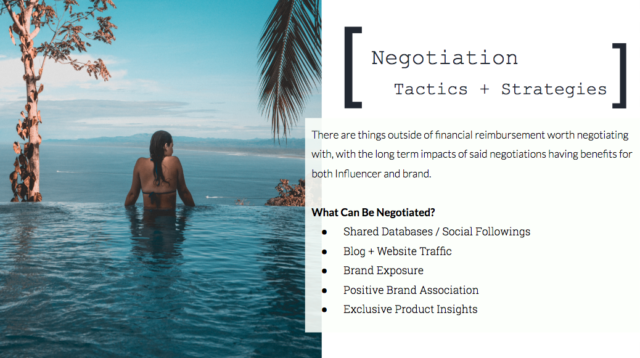 Typically, micro-influencers (that is, any influencer with a following ranging between 5,000 or 90,000) could be more flexible in negotiating some sort of compensation in place of cash, as they can also avoid management or agent costs tied to the jobs they take on. More than anything, it’s really important to remember that you’re collaborating with a person. 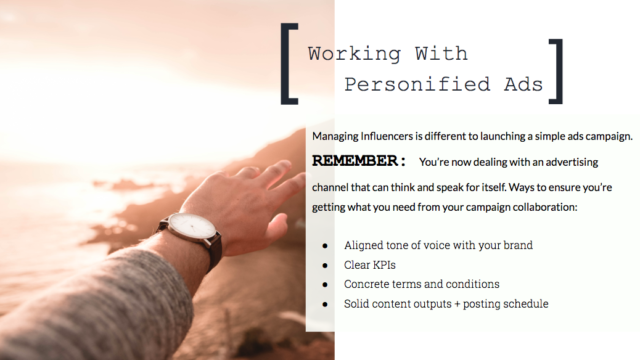 Although your company may decide between spending money on influencer marketing and a paid media campaign, an influencer will not accept any campaign that resembles paid media. They must think and speak for themselves in order to maintain their own personal brand aesthetic. Navigating clear deadlines and deliverables is essential to project managing any Influencer Marketing initiative. This should be outlined in a contractual agreement. 7. Get creative and have fun with it! The beauty of this amplification channel is the personified touch it adds to your brand and the credibility it offers (compared to traditional paid digital streams). You might think that only your customers could offer this level of brand advocacy. 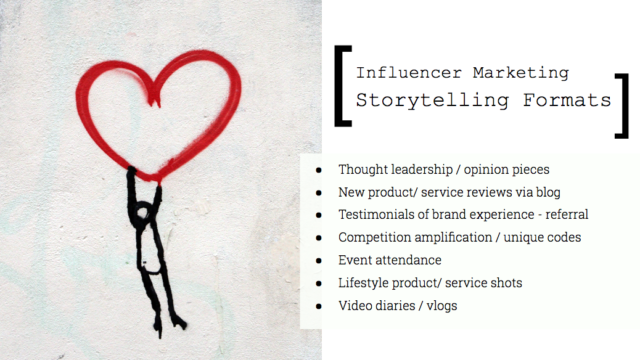 But, influencer open up a new way to share your story in a genuine way. You can’t get this level of authenticity from an internal brand representative. Get creative + have fun with it! I hope this update has shed light on all of your questions on influencer marketing and the positive impact it could have on your brand. I’d be keen to hear your take on what I’ve shared in the comments section below. 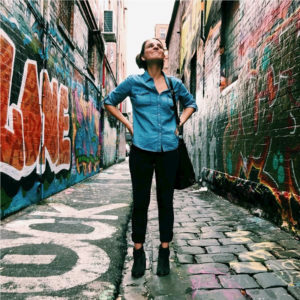 Katherine Chalhoub As Head of Social at Web Profits, my main focus is to build and lead a team of highly motivated and free-thinking individuals to develop creative social media strategies which successfully engage and personify businesses and brands alike.